I went trick-or-treating. Yes, I am 59 years old. Yes, I thought it was appropriate. Let’s just be clear. There is nothing like a crisp autumn evening creeping into a spooky, chilly night when the sun goes down early and the harvest moon spreads an icy hand over the earth. And this was nothing like it. We went in mid-September. The sun didn’t go down until nigh on eight o’clock. “Crisp” doesn’t really exist in Central Florida. In September, the weather is more accurately described as “limp.” There is enough humidity in the air to drown a goldfish. Disney has to pipe pumpkin fragrance into the crowded streets because real pumpkins would rot on contact with the atmosphere. When a friend called to ask if I wanted to go to the event, I hesitated. I’m not much of a night owl. I rarely go out after dark. My bedtime, forged by years of rising at zero dark yesterday for work, is ridiculously early. I don’t get up super early anymore, but I also don’t seem to go to bed any later than I did when I was working. I just don’t seem to have any endurance for more than twelve hours or so of activity each day. I also don’t like driving late at night. When my friend said she would drive, I decided my stick was stuck way too firmly in the mud for my own good and I agreed to go. I’m kind of glad I did not look the event up on the internet until after I committed to attending. When I did look at the website, I noticed that the party went from 7:00pm until midnight. For a “not so scary Halloween party,” that seemed pretty scary to me. If I had known the witching hour for the party actually was midnight, I might not have gone. I am a grown woman. It really shouldn’t be a problem to stay up past the end of prime time. Since I had committed to go, I tried to let the whole “I can’t stay up too late” thing go and just chillax. I didn’t quite succeed. About a week before, I broke down and texted my friends to see how late they intended to stay. I was relieved when they shared that they planned to stay until after the fireworks, which I figured would be over by about 10:30. That would mean getting home around midnight, which is still later than I’ve stayed out in years. However, somehow leaving at 10:30 seemed MUCH more doable than staying until midnight and I was able to manage my irrational anxiety about actually seeing the moon in the sky. The evening of the party was…. SURPRISE… hot. And humid. I was wearing a black polyester t-shirt with orange witch-hat-wearing Mickey Mouse heads all over it. Given the weather, I fully expected that the pattern would infuse my skin and I would have Halloween Mickey Mouse heads more or less permanently tattooed on my body when I peeled the shirt off at the end of the night. The park was also pretty crowded. I thought that the idea of paying the extra event admission was, at least in part, to minimize crowds. I thought wrong. The other thing I noticed throughout the evening was that there were a lot of people in those crowds who weren’t behaving very nicely. I go to Disney fairly often, so it isn’t like I have no experience with theme park manners meltdowns. I have to say, though, that I have never heard so many impatient, rude remarks as I did that evening. I think a lot of people had been park-haunting in the heat all day before the party even began and desperately needed a nap, preferably one in an air-conditioned room. The trick-or-treating portion of the evening was pretty fun. There were candy stations all over the park. I have heard tell of people collecting enough candy in a single evening to stock a small store. I’ve seen pictures on line showing serious hauls of five pounds of candy per trick-or-treater. My friends and I can go to Walmart and buy candy, so we were not that interested in schlepping around the sweet equivalent of a five-pound free weight the entire evening. We just visited the first candy station. We were pleasantly surprised to find out that our treat package of candy was…, CHOCOLATE! It was even more impressive that the chocolate remained formed into bars and had not melted into chocolate goo. I had figured that hard candy and jolly ranchers would be the order of the evening, as I just didn’t see chocolate holding up to the weather. Go figure. Must have been a little pixie dust magic! The lines for rides and character meet-and-greets were not shorter than regular Disney waits. In fact, I’d say they were longer. 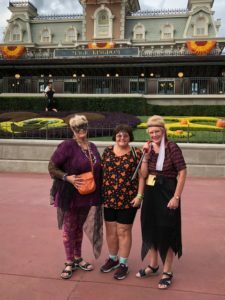 We went on the Haunted Mansion because, well, we were celebrating Halloween… and there was some pretty cool entertainment outside in front of it. We also went on Pirates of the Caribbean, which was a fantastic surprise because Disney had changed some of the ride details and had incorporated some live pirates into the mix. We tried to watch the show and the parade and the fireworks and we saw a little bit of all three events. The crowds were so large, it wasn’t really possible to really see anything. I fancy it was a bit like being in Times Square on New Year’s Eve. You aren’t going to really see anything more than a few inches away from you, but you still have an exciting, electrifying experience. In fact, the entire evening was sort of like that. We had a really fun time, but not because of any particular entertainment. It wasn’t about the rides or the shows or any of the normal Disney daily delectables. The event is called “Mickey’s Not So Scary Halloween Party” and the emphasis is on the party. There was music and people and energy. It isn’t so much an evening at the Magic Kingdom as it is a happening. The most fun was watching the people in costumes, getting carried away by the mood, and enjoying the fine art of play. And doing it all with friends. So, thanks to my friends Babs and Kathy for pushing me out of my comfort zone and into the shadows for a not so scary evening! What do you have planned for Halloween? Is your celebration different now than in an earlier time in your life? Please share your perspective by leaving a comment. In the alternative, you can email me at terriretirement@gmail.com. This week, I am going to write about passion. Calm down. I’m not talking about that kind of passion. I’m talking about the passion that fires the engine of positive change. I’m talking about the kind of passion that motivates people to reimagine and push beyond the societal boundaries that no longer serve the society. I am talking about the Robert F. Kennedy kind of passion that doesn’t look at the world as it is and ask why but imagines the world as it could be and asks why not. It was my book club that recently started me thinking about this kind of passion. Two of our books in the last cycle were stories of real life women whose passion forced dramatic and painful metamorphosis. The changes were ultimately creative and necessary, but the passionate lives that inspired those changes could certainly have been seen as destructive and dangerous in their time. The books were Desert Queen by Janet Wallach and Testament of Youth by Vera Brittain. Desert Queen told the story of Gertrude Bell. Bell grew into adulthood in the first part of the twentieth century. Despite the suspicion with which polite English society viewed education and independence in women at the time, Bell fought for an education. She spent her adult life collecting new experiences. She became a renowned archeologist and prominent field researcher in the Middle East. She was instrumental in trying to forge and maintain a delicate balance of power and competing interests in that volatile region after the first World War. Historians sometimes refer to her as the female Lawrence of Arabia. Testament of Youth is Vera Brittain’s memoir of her education, experience as a field nurse in World War I, and, ultimately, her crusade for pacifism. It chronicles her romance with the young man she loved and admired more than anything else in the world. He left a life of study, achievement, and potential to become soldier. Like many young men of the WWI generation, he died before he had a chance to build a life. While the two books focused on two different themes (the development of the Middle East in the case of Gertrude Bell and the achievement of lasting world peace for Vera Brittain), both books demonstrated the passion with which the respective women pursued their causes. They lived and worked in roughly the same time period. It was a time period during which the world granted little respect for women who lived with the type of passion that is a combustible fuel for change. Both had to snarl and claw and outwit their way to their achievements. Both had lasting impact in the development of women’s rights. In some ways, the books are less about the Middle East and pacifism than they are about the power of independent, intelligent, strong women… and the richness and wonder the world deliberately refused for centuries in resisting the contribution of such women. Despite my admiration for both Bell and Brittain, I have to say that I didn’t particularly “like” either book. I found myself feeling distinctly uncomfortable while reading the books. It took some reflection to figure out that it wasn’t the books I disliked, but the characters. That’s right. I didn’t like Gertrude Bell and Vera Brittain. While I respected their accomplishments and admired their strength of character, I just didn’t like them. They came across as strong to the point of being strident, confident to the point of being arrogant, brave to the point of being foolhardy, and single-minded about their beliefs to the point of exclusion of all else… including personal relationships. I am happy that they helped create the world I enjoy today. I just didn’t find them all that appealing to be around, even in the pages of a book. The stories of Gertrude Bell and Vera Brittain caused me to wonder if it is possible to be an agent of positive change with a gentler, defter, less corrosive… maybe less passionate… touch. Maybe the answer is no, especially for a woman and especially for a woman of their time. Maybe the only way to get the status quo’s attention is to bash instead of tap. I’ve wondered about this before. I think about some of the women I’ve known whose achievements I admire. The women that I see as remarkable in what they have accomplished are filled with passion. Honestly, I usually don’t find them all that pleasant to be around. I wouldn’t say that they believe the ends justify the means, but I do think they are okay with some collateral damage in pursuit of what they believe is the common good. They are able to accomplish great things, but people tend to get hurt by the shrapnel. They do value the people around them (or, frankly, they wouldn’t have those people around them), but believe that everyone has the same burning passion towards the goal and forgives any incidental relationship damage. I think they almost believe that the relationships are stronger because of the drama they undergo in the pursuit of the goal. Part of passion is swinging wildly on the branches of unimaginable highs and crashing to the depths of unbelievable lows. Me, I like being part of the pursuit and working with others to achieve a goal…. but, at a certain point, I like to return home from the jungle. That may be the nib of it. People are just different for a reason. Even back in the middle ages, physicians believed people were governed by their different “humors.” They believed that a person’s health and disposition were comprised of blood (sanguine), yellow bile (choleric), black bile (melancholic), and phlegm (phlegmatic, of course). They assigned an element to each of these humors. The choleric humor was fire. People with an overabundance of the choleric yellow bile were thought to be filled with fire, heat, and aggressiveness. The phlegmatic humor element was water. People with an overabundance of the phlegmatic humor were thought to be cold and staid and predictable. Maybe the passionate change agents of the world, filled with fire and bile, do have to have a certain edge and single-mindedness that phlegmatics like me lack. On the other hand, one of my personal heroines is St. Therese of Lisieux. I think anyone would say that St. Therese was passionate about her faith. She said that she could not do great things but could do small things with great love. Perhaps she did not do great things in her lifetime. However, in the centuries since, her life has touched the hearts and changed the souls of millions. Perhaps there are different paths to passion and perhaps that is why we are all different. Our world needs all of our passion- no matter what that passion looks like- to focus on creating something wonderful. We can all contribute to that “something wonderful” in whatever way God leads us. In my case, I think that He has made me phlegmatically passionate! What do you think? Who are your personal heroines and what does passion look like in their lives? How has passion motivated you to be the person you are? Please share your perspective by leaving a comment. In the alternative, you can email me at terriretirement@gmail.com. I have a friend who routinely sleeps her way through flights from Honolulu to Washington DC. I am in awe of her. It isn’t that I get nervous flying or anything like that. It is just that I’ve always been a terrible sleeper. For as long as I can remember, sleep was hard work. For something that is supposed to be an automatic physiological process, it certainly alludes me. Even when I was a little girl, I couldn’t just close my eyes and sail sleepily off to the Land of Nod. My mother used to dose me with Tylenol the night before the first day of school on a regular basis. I am not aware that Tylenol has any anti-anxiety or sleep-inducing properties, but she swore by it. I never had the heart to tell her that it didn’t make the slightest bit of difference. What my mother did get right, though, was her intuition that I had trouble sleeping because my brain just wouldn’t shut off. My mind often manufactured strange sights and sounds emanating from my closet. I reran the activities, anxieties, and mistakes of the day until the soundtrack screamed inside my head. Even when I did sleep, my brain tended to stay half alert. That half alert portion of my mind would entertain itself by telling itself stories… usually not very pleasant stories. Hence, it was common for me to wake from any slumber I did get, completely convinced that the dreams I had been dreaming were real. As a child, I sometimes had night terrors. I would awake screaming and crying hysterically without knowing why. Once in a while, I would even sleep walk. Even when I grew up, I would sometimes wake to find myself curled up on the floor with no memory of how I got there. Understandably, the night terrors started training me to not sleep. I would be awake all night with some regularity. As anyone with even occasional insomnia knows, the worst possible thing you can do is to lie there in the dark thinking. I knew that instinctively, even as a child. I tried counting sheep like in the cartoons, but those sheep always seemed to live more interesting lives than I did. My imaginary sheep, instead of just leaping the imaginary fence as I counted them, would talk and wander off on adventures. I tried praying, but this would often end up with me thinking a great deal more than was conducive to sleep. I tried reading with a flashlight under the covers until my parents confiscated the flashlight. Neither of my parents ever had a difficult time with sleep, so they were a bit perplexed when I tried to explain what I experienced. My mother employed two strategies when she found me awake at some inappropriate hour. First, she would simply tell me to “stop thinking and go to sleep.” When that didn’t work, she would haul out the Tylenol. At least dosing me with acetaminophen made my mother feel better, even if it didn’t get me any more shut-eye. As an adult, my sleep never really improved. I came to accept that there were no monsters in my closet, but the real-life monsters in my head were still there. In times of particular stress, I stopped sleeping completely. I remember once, after my ex-husband left me, I didn’t sleep for five nights in a row. After some persuasion, I allowed my doctor to prescribe some sleeping medication. I then accused her of giving me placebos because the sleeping pills didn’t seem to help. Sleep deprivation does tend to make one a bit irrational. She swore up and down that the medication was real, but I still am not sure I believe her. I did eventually start sleeping again, of course. The overall problem continued, however. When an interaction with a customer did not go well at work, I could pretty much count on spending the night trying to retool the conversation instead of sleeping. There were lots of times when a simple phone message from a difficult person was enough to bar the door to Zzzzville for me. When my mother was ill, it was rare that I ever slept more than 3 or 4 hours a night. I tried all the home remedies. I tried to go to bed and get up at the same time each night. I tried turning my clock around so I couldn’t see the time. I tried relaxation exercises. I tried getting up and doing something calming for awhile when I did not fall asleep after twenty minutes or so. Given that criteria, I was up doing “something calming” for most of the night. I took over-the-counter sleeping pills. What I didn’t do was put my phone in another room so it wouldn’t have been as easy for me to maniacally google every thought that came to my mind, in a vain attempt to find the answers to unanswerable problems. Again, sleep deprivation does tend to make one a bit irrational. Since my mother’s death, my sleep and lack thereof has pretty much returned to my “normal.” Towards the end of my mom’s illness, my doctor prescribed a new kind of sleep medication. Its formula is designed specifically to shut down the “awakeness” of the brain. It is wildly expensive. Also, the pharmacist acted like I was asking him for heroin when he filled the prescription. I took the hint and only take it when I have gone several nights in a row with no sleep. It helps a lot. I am also finding that my recent journey of self-happiness is helping. As my brain gets more practice at living in the moment and saying “yes” to things I want to try even if they are outside my comfort zone, I seem to be able to say “yes” to sleep a little better. I will probably never be a talented sleeper. When most people get their forty winks, I only get twenty-two-and-a-half. But I’m trying not to let that fact keep me up at night! What helps you sleep? What techniques can you share that may help me increase my wink production? Did you notice a change in your sleeping patterns when you retired? Please share your perspective by leaving a comment. In the alternative, you can email me at terriretirement@@gmail.com. All of you who know me IRL (and, by now, probably most of you who know me only through the blog) know that flexibility and rolling with the punches are not exactly my strong suit. I really prefer a life where things are planned and scheduled. I like to know what will happen and when it will happen. Uncertainty causes me great anxiety. When things don’t go as I expect, I can go off the rails pretty easily. I can think of numerous times in my life when plans went awry and I was left, gob smacked and paralyzed because I couldn’t figure out what to do next. On my recent trip to New England, life wasn’t playing by my rules. In fact, it might have been the most troublesome trip of my life. We were delayed for 4 and a half hours trying to get out of the Orlando airport. There were three different mechanical issues that delayed us… each discovered right after the previous one was resolved. Not only did our plane experience multiple problems, those problems could not even have the goodness to happen concurrently. We “almost” left about four times before we actually did make it off the ground. We loaded and unloaded the plane multiple times. When we finally got the second (or was it third?) safety check, apparently poised to actually get the airplane into the air, there was a further problem. One of the disgruntled passengers was on the phone to the airline headquarters, negotiating at the top of his lungs to get a travel voucher for his trouble. He refused to stop yelling long enough to listen to the safety instructions or hang up his cell phone for take-off. The rest of us were ready to pounce on him. If he had not finally shut up and apologized to the flight attendant, I think we would have had to go back to the gate AGAIN to have him removed from the flight. Had that occurred, I doubt he would have made it to the parking lot without serious injury. By the time we got to Boston, I had put aside this sketchy beginning to our trip. I was ready to have a good time. Unfortunately, the travel gremlins did not get that particular memo. During our sojourn, I tripped over a step in Bar Harbor breakfast room (take note, all you who objected when I said I am an exceedingly clutzy individual.) I remained upright, but a bottle of milk on the buffet table did not. I managed to spill the entire serving carafe of milk on the (carpeted) floor. The food on my plate went flying across the room, with considerable less delay than our plane from Orlando. The bus we originally boarded in Boston did not have a working microphone system, so the poor tour director had to wend her way down the aisle repeating her spiel every few seats until we got a new bus a few days later. We were two hours late getting to New Hampshire because of traffic related to a small-town fair that is apparently attended by the entire population of Maine. Our bus driver nearly missed a stoplight in Massachusetts and slammed on the brakes, sending people and water bottles tobogganing down the aisle of the vehicle. In one hotel, a fire alarm went off at 4:15am, requiring us to evacuate and stand around in the cold in our jammies for an hour. We arrived back in Boston to the city’s first ever hotel strike and the resultant picketing and catcalling. Finally, on the last morning of our trip, as we were packing to leave, the fire alarm squawked. It was a sign from God to go to the airport, even though it was a couple of hours before we intended to leave. Yes, this certainly qualifies as a candidate for the most troublesome trip ever. It might also have been the most wonderful trip ever. How could this be? Simply put, I fell in love with New England. And maybe, just maybe, I am learning that a beautiful gift packaged in bedraggled gift wrap is still a beautiful gift. And New England was a mind-expanding, life-enhancing, oh-so-beautiful gift. Everything bad that happened was just the bedraggled gift wrap. I rose above it. I chose to live in loveliness and lovingliness. I loved the fall foliage bursting with color and warmth and magic. 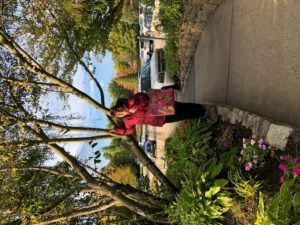 I remember my mother once saying “when you see one tree, you’ve seen them all,” when I asked her how she enjoyed one of the tours she and my father took. For me, it was more like- “if I see one tree, I want to see them all.” I rode, hour after hour, drinking in the landscape as I stared, mesmerized, out the window. I didn’t even blink very often, for fear of missing even a slight smidgeon of miracle. 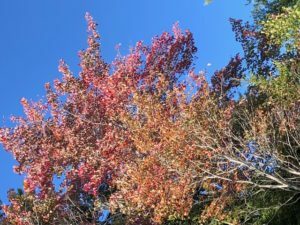 I developed a sort of involuntary gurgling noise that became Max’s “exceptionally beautiful fall foliage early warning alarm.” Whenever he heard me emit my gurgle, he knew to turn to see what was delighting me. I loved the rocky coastline of Maine- wild, free, and powerful. I loved the food- the lobster and the popovers and the gingerbread and the cheese and the apple cider donuts. 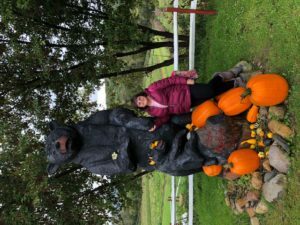 I loved the ever-present autumn decorations- pumpkins and mums and cornstalks. I loved the beautiful paths to nowhere- except more beauty- that swirled around the rivers and meadows and forests. I also loved the serendipity. I loved the way the air smelled and tasted. 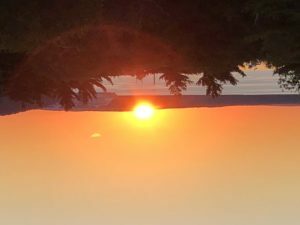 I loved the quiet, dignified sunrise over Bar Harbor. I loved that Max tried to ring the church bell in New Hampshire by swinging on the rope. I loved meeting a “local” artist who, before living in New Hampshire for about 10 years, had lived about a mile from where Max and I lived in California. He had been the illustrator for the California newspaper that both of us had read most of our lives. I loved the whimsical statues of bears and moose we saw at nearly every stop. I loved the soothing jacuzzi in the ski lodge in Vermont. 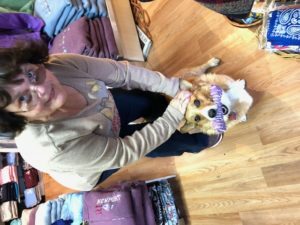 I loved meeting the little welsh corgi “saleslady” in a souvenir shop in Newport. 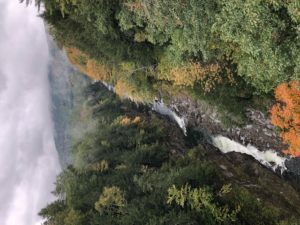 Yes, it was a wonderful trip and I am still smitten by New England. I know I will likely never move there. I don’t really want to rebuild my life again. 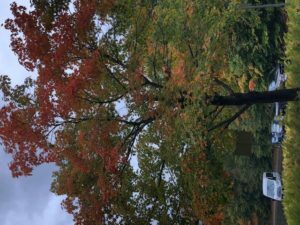 As Max kept reminding me, within a couple of months, the many colors I so fancied in the fall forests will be replaced by one color- white, white, and more white. While I think I could do better with cold than with the Florida summer heat, I don’t have any experience with managing snow and ice. I know I get antsy if I have to go more than a day or two without getting out of the house here in Florida. Winter in New England might give me terminal cabin fever. I have a great life in Florida. I am sure my life is easier than it would be in New England. I have an active life, with plenty of fun things to do. I have wonderful friends who I don’t want to leave. Still, when the time comes for God to bring me Home, I hope we make a brief detour for a few decades in New England. In the scheme of eternity, it wouldn’t be much of a delay and I think my soul was meant to have a New England life. I have to apologize for the pictures. I wanted to share some, but they don’t do justice to nature’s beauty. Also, I can’t figure out how to get them to line up the way I want them to, so you might have to tilt your head a bit! Please don’t throw your neck out! What is the most beautiful place you have ever been? Please share your perspective by leaving a comment. In the alternative, you can email me at terriretirement@gmail.com. I’ve wandered off the grid this week, so there won’t be any new Terri Tales today. I know you are disappointed, but I’m sure you can withstand the loss. I have faith in you. To help you cope with a week without me, I wanted to leave you with a little public service announcement to ponder while I am gone. I’m sure most of you know by now that I have written a book based on this blog. The book is called Changing My Mind: Reinventing Myself In Retirement. I’ve published it under my “real” name, Dorry Curran. The book has been out for about six months now and has been well reviewed by those who have read it. For those of you who have not read it, why haven’t you? I’d like to help remedy that sad state of affairs by reminding you how to purchase the book. I’d also like to suggest that the book (besides being entertaining, helpful, and thought-provoking) is pretty darn nifty-looking. You probably don’t want to hear this, but we are entering the Christmas shopping season. Also, many people retire at the end of the year and it is sometimes hard to think of a retirement present on top of all those Christmas presents you have to select. Changing My Mind is a suitable gift for every occasion. You can order as many copies of the book as you like by visiting my direct-to-reader page at: https://secure.mybookorders.com/orderpage/2076 If you use the promo code terri, you will get a 15% discount on paperback copies. You can also get the book in electronic form, compatible with either Kindle or Nook. If you prefer, you can also get the book at amazon.com or barnesandnoble.com in both paperback and electronic formats. The discount code will not apply to those order sites, however. So, please consider buying a copy or several copies of Changing My Mind. If you enjoy the blog, I know you will enjoy the book. Remember…. I have faith in you! So, for those of you who have read the book, what can you say about it that might help someone else decide whether or not to buy a copy? Please share your perspective by leaving a comment. In the alternative, you can email me at terriretirement@gmail.com. Sending me an email might not really have the desired effect of tempting others to buy the book. Still, if you aren’t comfortable leaving a comment and would still like to say something about the book, I’m happy to get your feedback by email.